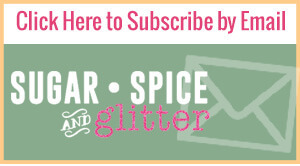 Long time readers know that I run a home-based preschool program – 3 days a week, an onslaught of children embark on a mission to destroy my house and we always have a blast. 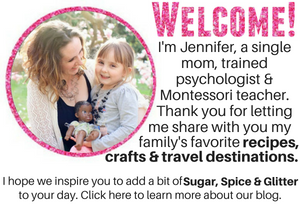 Even though food photography and recipe development is what really pays the bills around here, I just can’t seem to give up the chaos and noise that comes with attempting to do Montessori with a bunch of three year olds. Recently, all but one of our kids was sick for the day, so it was just Miss V and I all day while my daughter was at school. She was excited to have me all to herself but also disappointed that none of her friends had shown up to play, so I let her decide what we’d make for lunch. I love how three year olds think! 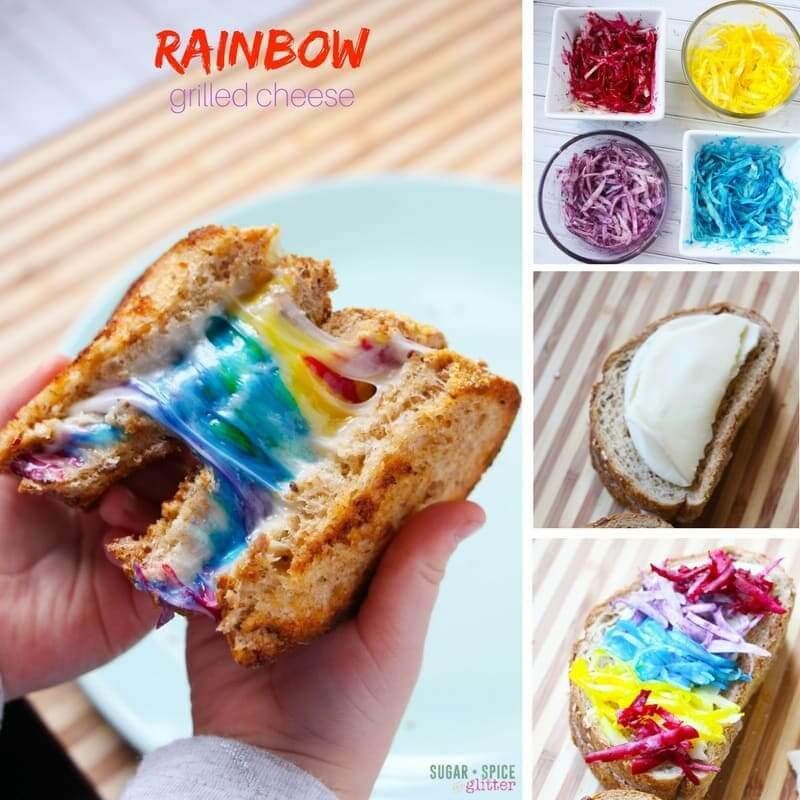 Ella had eaten a rainbow grilled cheese on our last trip to Disney, it was a grilled cheese on rainbow bread – which we definitely need to try but I wanted to come up with something a bit quicker. My initial attempt to “paint food dye” onto the cheese didn’t really achieve the saturated look I was hoping for, but this shredded cheese method works perfectly. 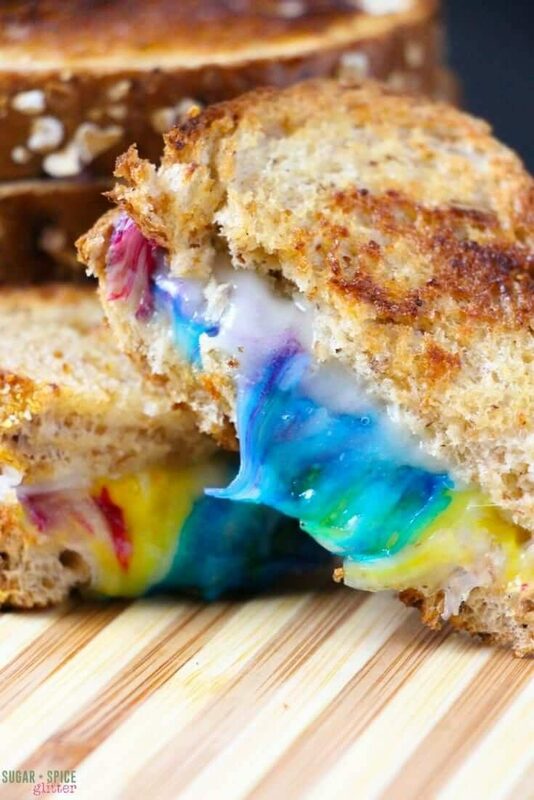 I love that the sandwich initially looks like an ordinary grilled cheese sandwich, only to be pulled apart to reveal a gorgeous, ooey, gooey cheese rainbow! 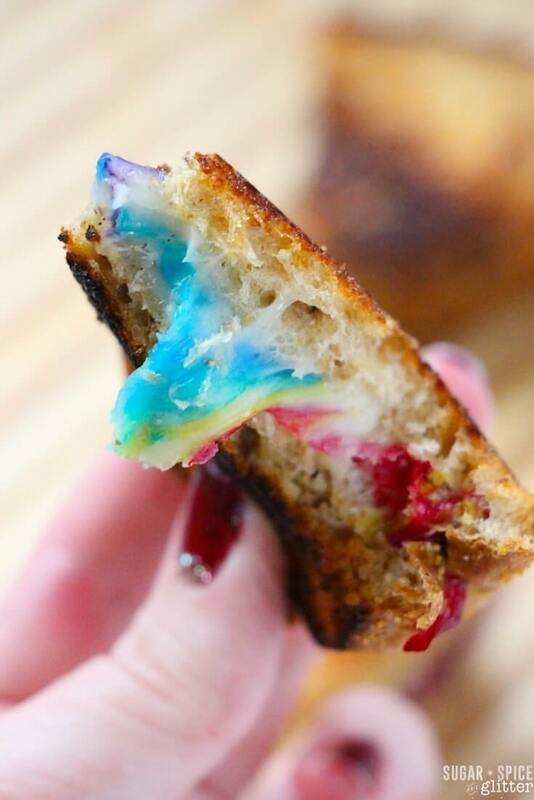 This rainbow grilled cheese sandwich would be perfect for a special birthday, as a savoury offering at a Rainbow- or Unicorn-themed party, or for a kid-friendly St. Patrick’s day lunch. 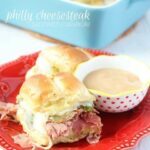 Note: this recipe makes 4 sandwiches. 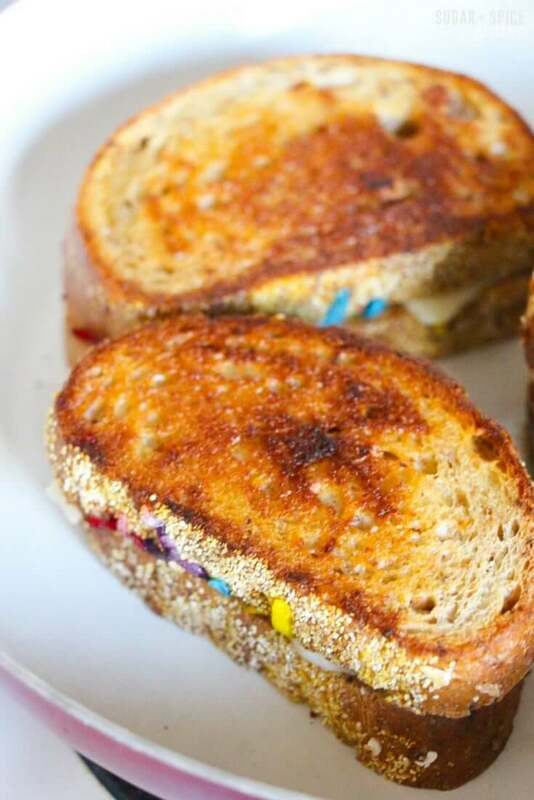 You can use garlic butter or garlic-infused olive oil to toast the sandwiches for a delicious twist! Butter one side of each slice of bread and set aside. 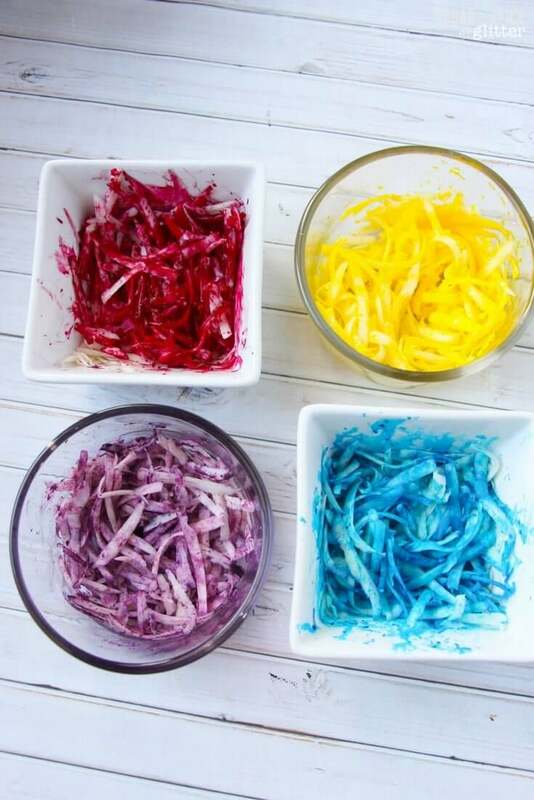 Place 1/4 cup of cheese in 4 bowls and add food dye – yellow to one, red to one, blue to another, and red and blue to make purple in the 4th. Stir the food dye into the cheese. 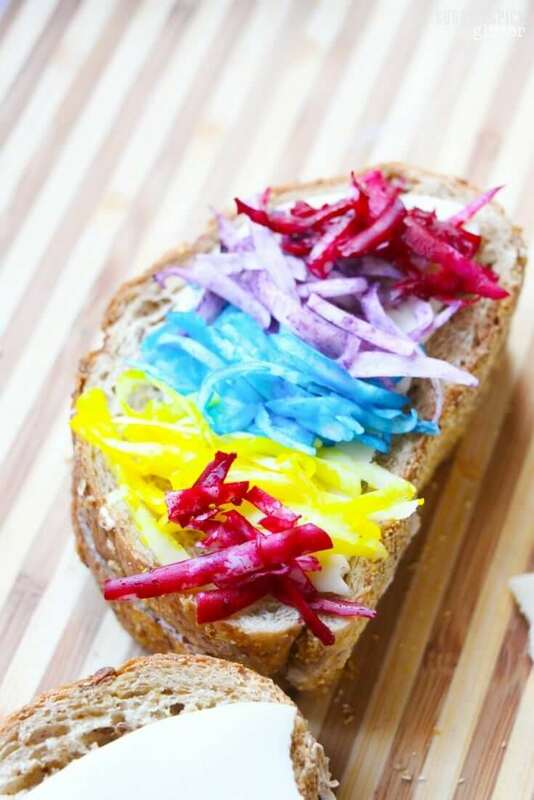 Cut the slices of provolone in half and place one on each slice of bread – on the unbuttered side. 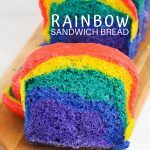 Sprinkle 1-2 Tablespoons of the colored cheese in “lines” or strips on top of 4 of those slices, overtop of the provolone, in the order of ROYGBIV (mix the red and yellow to make orange, yellow and blue to make green). 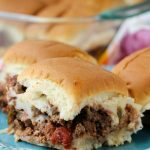 Sandwich a slice of bread with provolone over the shredded cheese and place in a frying pan over medium heat. 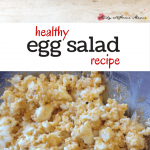 Cook until golden brown, about 2 minutes, and then flip. Place 1/4 cup of cheese in 4 bowls and add food dye - yellow to one, red to one, blue to another, and red and blue to make purple in the 4th. Stir the food dye into the cheese. 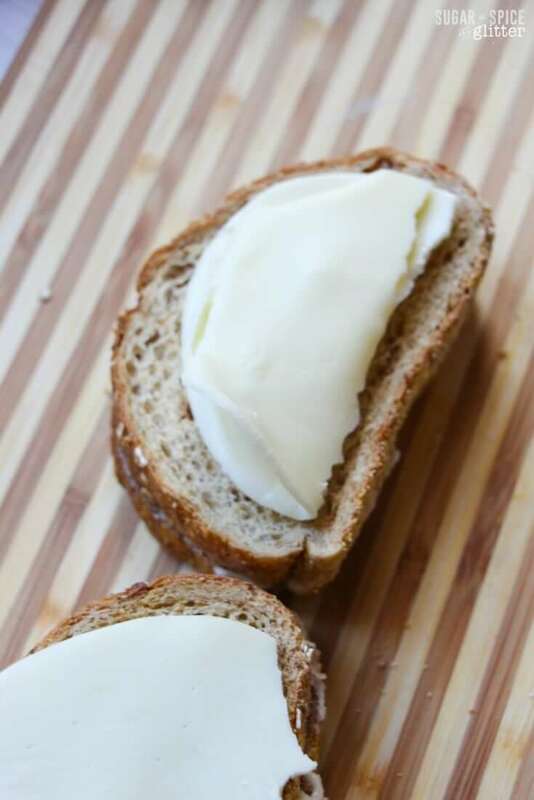 Cut the slices of provolone in half and place one on each slice of bread - on the unbuttered side. 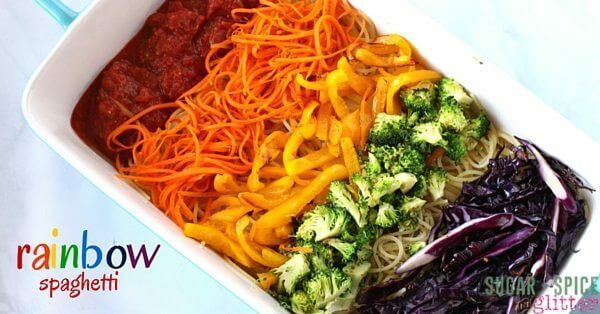 Sprinkle 1-2 Tablespoons of the colored cheese in "lines" or strips on top of 4 of those slices, overtop of the provolone, in the order of ROYGBIV (mix the red and yellow to make orange, yellow and blue to make green). 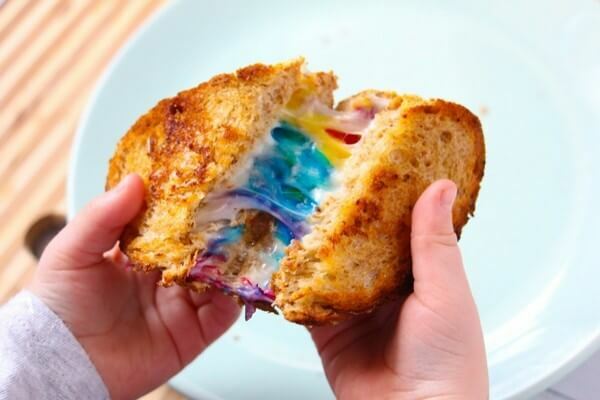 Would your kids go crazy for this easy and delicious rainbow grilled cheese recipe? 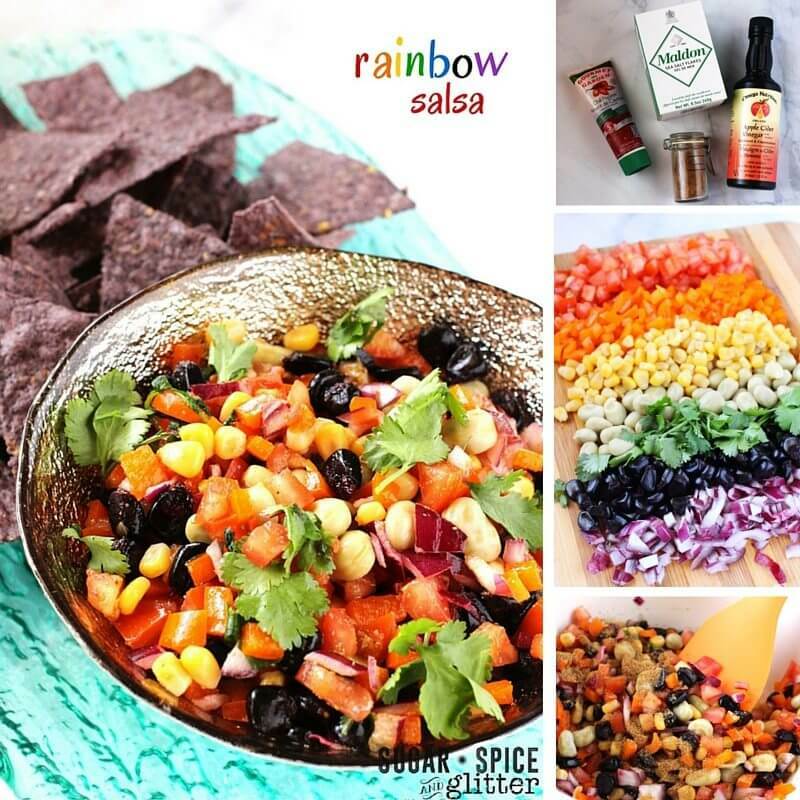 For more delicious and healthy rainbow-inspired recipes, check out our healthy rainbow spaghetti recipe or our fresh rainbow salsa recipe.